Sunway Putra Mall is holding a seasonal campaign by offering you rewards, amazing prizes as well as shopping vouchers when you shop! All you need to do is spending a minimum of RM 100 accumulated across a maximum of two receipts (within shop in the mall) starts from Aug 25 to Nov 25 2016 and you’ll get a chance to Spin and the Wheel! Good news for HSBS credit card shoppers, if you meet the requirements by using their credit card, you’ll be entitled to a bonus spin. 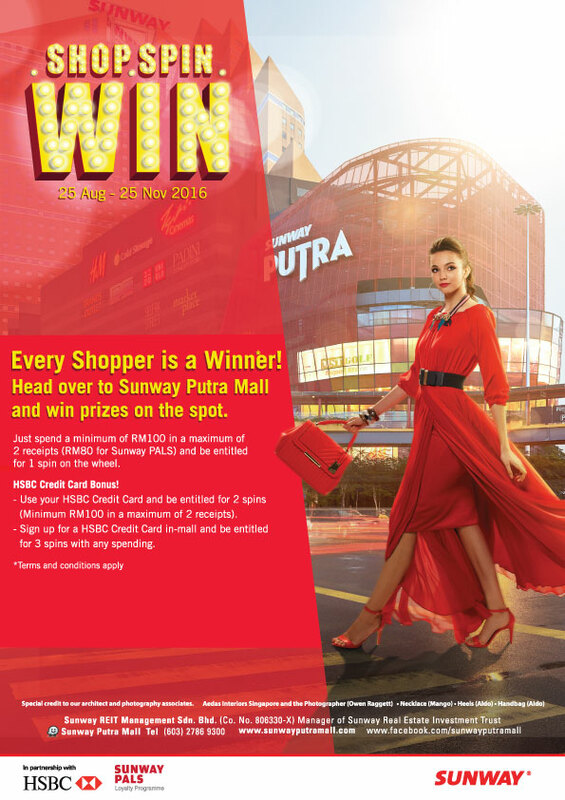 The objective of this interactive campaign is Sunway Putra Mall wants to reward you, its shoppers where you’re not only get to enjoy your leisure time at the mall, but also you’ll get the chance to bring home awesome prizes from them! Just so you know, there are more than 300 retail outlets at Sunway Putra Mall, some of which have sponsored prizes and cash vouchers in this campaign. Sunway Putra Hotel, Sunway Lagoon, Sunway PALS, Swarovski, H&M, Monki, Wah Chan, Las Vacas, Rakuzen, SportsDirect.com are all included! And there are more than these! The best thing part is you will get a free parking for two (2) hours on spending at any outlet within the mall. And of course! HSBC credit card holders also get a car park free. Who would refuse with all this advantages and the gifts you will be taking home, hurry down now to Sunway Putra Mall and begin shopping spree to spin and win! For more information, visit the mall’s website. Watsons: Buy more, save more!